My father in-law is good friends with my former primary school headmaster (rif and I call him Guru Besar), and they would go for tea sessions every weekday evenings. Guru Besar watched us grow up and even attended our wedding dinner. He’s been a good family friend and contributed to a few of my blog content and articles in The Star. 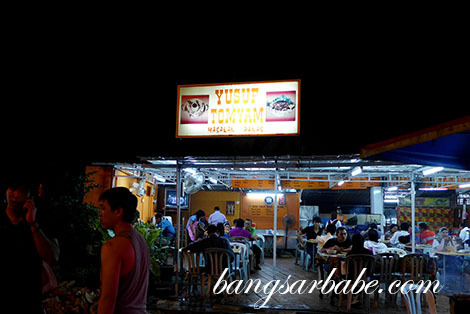 Anyway, he recommended Yusof Tomyam in Lucky Garden Bangsar for good Malay food. 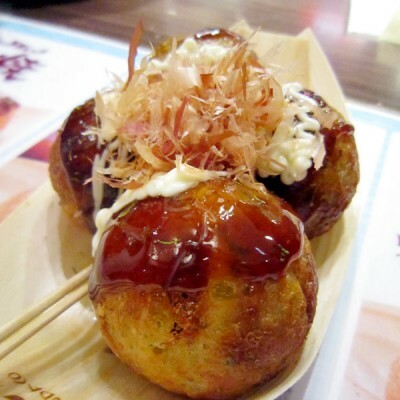 rif and I tried the food there recently and we weren’t disappointed. Between the two of us, we shared the ikan bawal goreng tiga rasa, telur bistik, kangkung belacan and tomyam campur. While tucking into the food, I regretted not trying this place earlier. 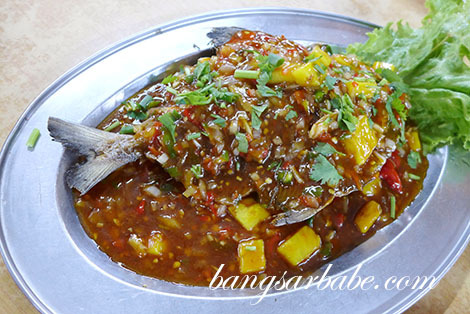 The fish (RM25) was deep-fried till crispy perfection, and topped with the piquant tiga rasa sauce. This was spicy, sweet and savoury with a good kick from the chilli padi. The kangkung belacan (RM4) was simple but nicely prepared. 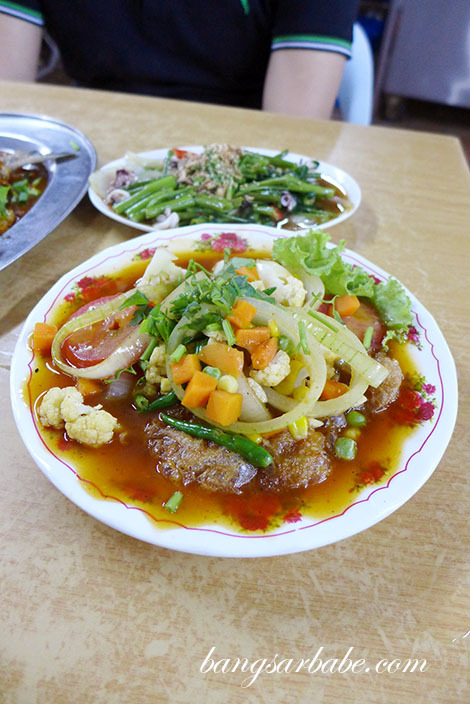 There was a good dose of belacan flavour and the vegetable was cooked till tender. It also came with squid slices and crispy garlic on top. Another simple but delicious dish was the telur bistik (RM4.50). The cooking style wasn’t anything special, but it was a hearty omelette containing chopped vegetables, minced chicken and tomato-chilli sauce. Both this and the kangkung belacan went well with white rice. I’m a fan of Malay style tomyam, but many places serve a floppy and disappointing version of it. But like the name suggests, Yusof Tomyam’s version (RM6) was not bad at all. It’s not the best I’ve tried, but for now, it ranks up there in my list of decent tomyam. 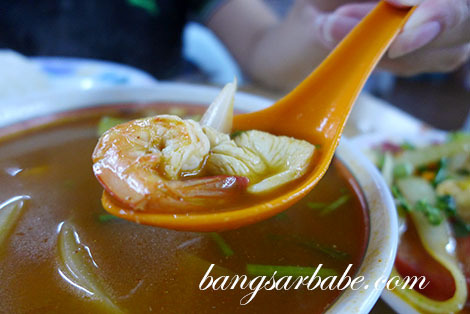 The soup had a good balance of spicy, sour and savoury, with a sweet touch from the seafood. 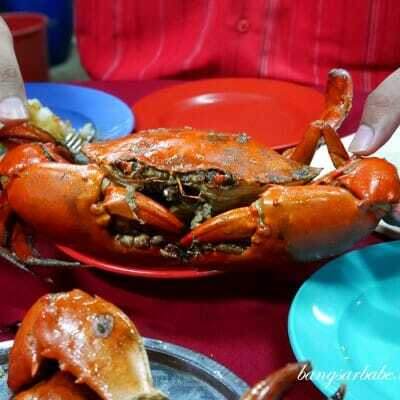 Dinner came up to RM45 for the above, including two drinks. Not dirt cheap, but pretty reasonable for Bangsar’s standard. I’ll definitely return to try more items. The nasi goreng pattaya looked good. According to my father in-law, Guru Besar prepared a list of places I should try for my blog content. I look forward to exploring them soon. Thank you Guru Besar! Verdict: Pretty good Malay “big fry” and reasonable prices. Hopefully they stay this way. Time to make a trip there? It’s been a long time since I had tom yam or even Malaysian fish, definetly will try when I get back.